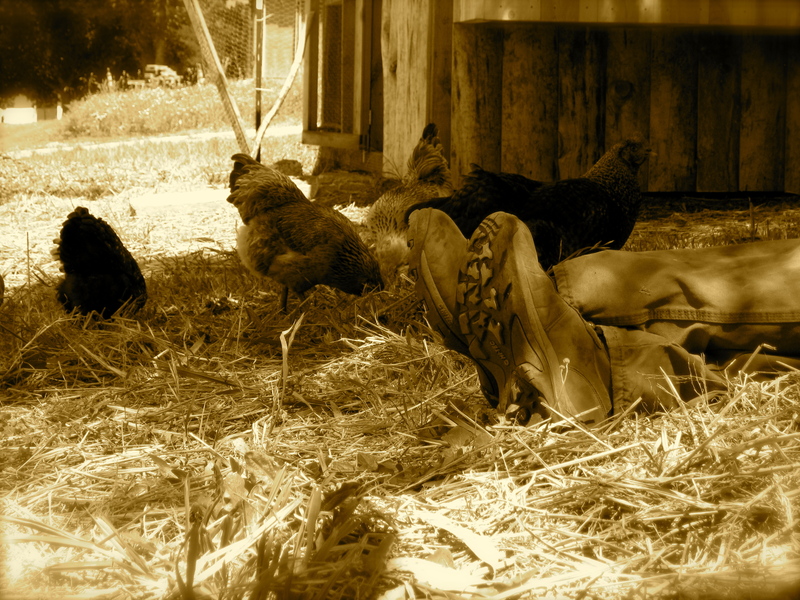 We got our first batch of chicks, back in 2011, from a local feed store, selecting a variety of standard-size laying breeds plus one Bantam hen. At the same time, a friend gave us 8 Cornish Cross chicks, which are the most common breed used for meat in the United States. First batch of chicks, cozy in their box in the house. 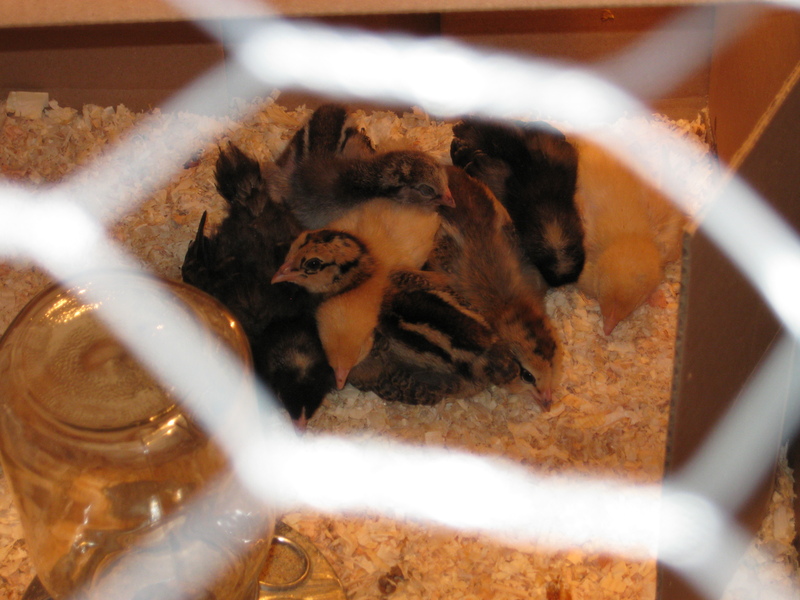 We kept the chicks in a cardboard box in the house for a few weeks, so we could keep an eye on them. They seemed small and too vulnerable for the outside world. Given that the cat was also in the house, this may not have been the best idea, but everyone came out of it fine. 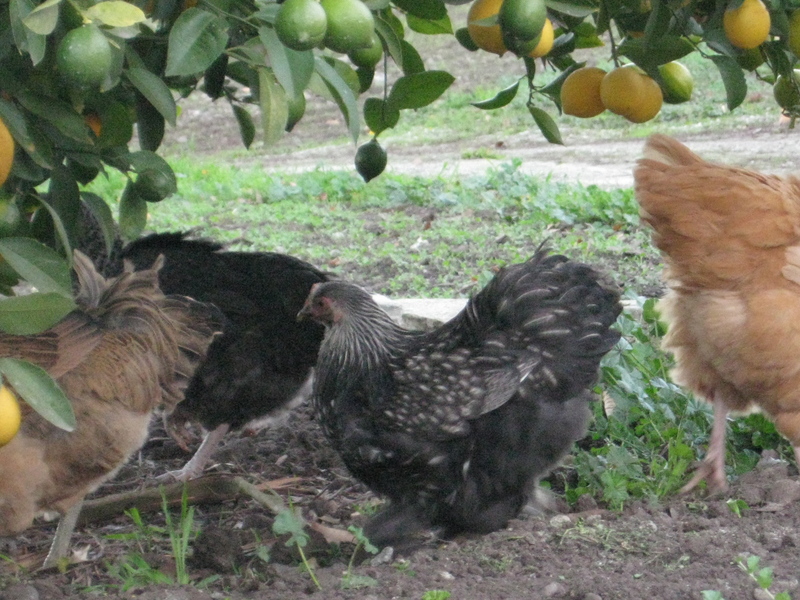 They were soon too stinky for the house, so we moved them to the outside coop. Initially, we put their cardboard box, with supplemental heat in the form of a light bulb, out there with them, but removed that when they were a month old. Five week old chicks in the main coop. They grew up and we let them run everywhere. Our Bantam hen, Mr. Pants, under the lemon tree. We butchered the Cornish Cross when they were about 8 weeks old, and made some scrumptious meals out of them. At about 5 months the laying hens started producing delicious eggs. 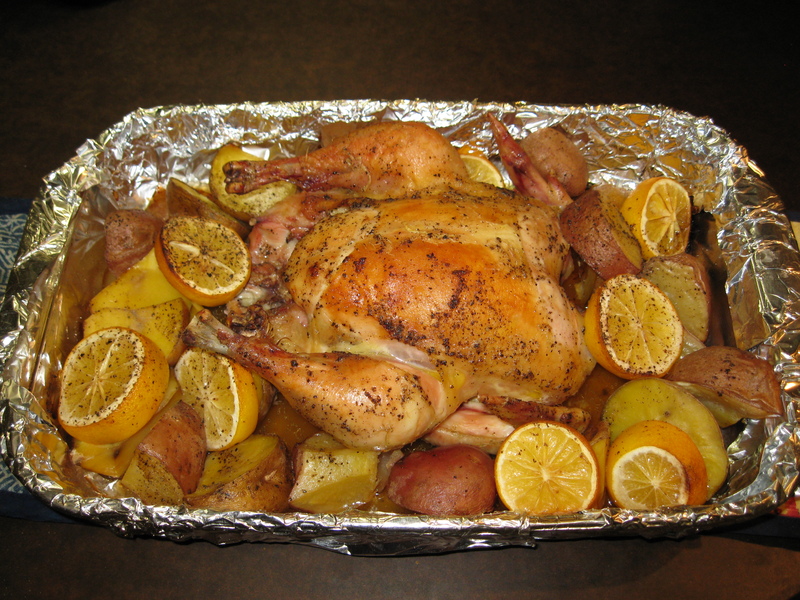 Cornish Cross, pan-bbq’d with lemon, rosemary, and potatoes. This was all working out quite nicely, except for a few things. First, although we loved the idea of free-ranging chickens eating the bugs from our garden, the chicken poop on the patio was not ideal. Second, although the Cornish Cross were amazing in terms of their rate of weight gain, ease of processing, and tenderness, we were a bit put off by their appearance (they were sparsely feathered, had an incredibly wide and breast-heavy body, and seemed to have difficulty standing and walking past about 4 weeks of age) and lack of interest in anything beyond eating. 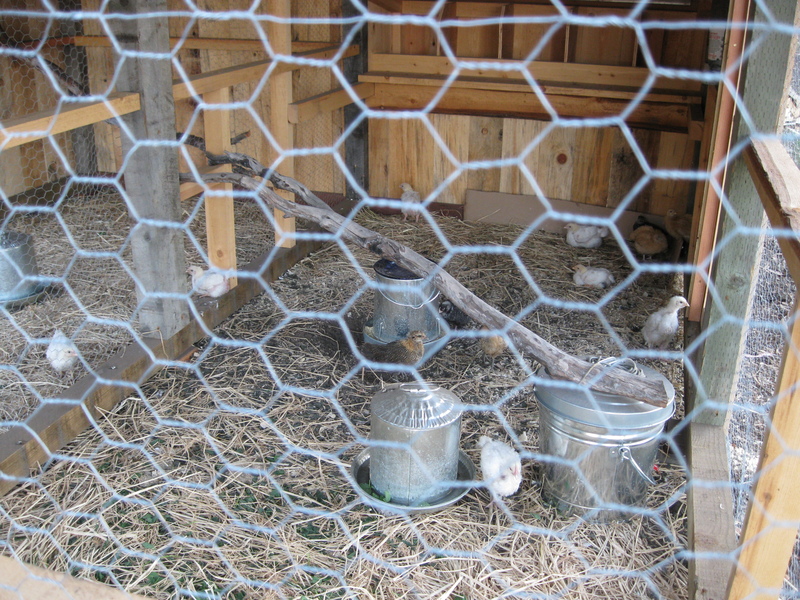 Third, we did not want to have to buy and care for new chicks each time we needed more, nor did we want to purchase so much of our chicken feed. We wanted a system that would regenerate itself. In future posts, I’ll describe how we have modified our system to make something more to our liking. 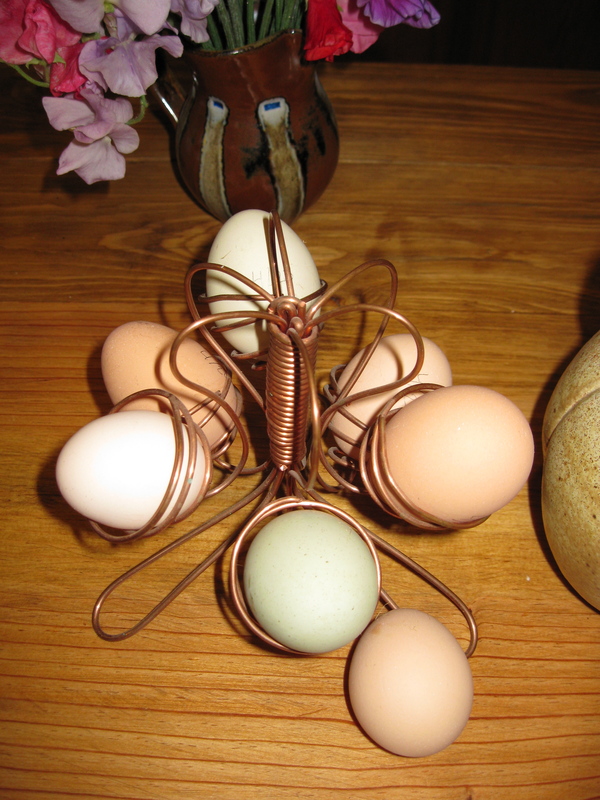 This entry was posted in chickens and tagged chickens, Cornish Cross. Bookmark the permalink.